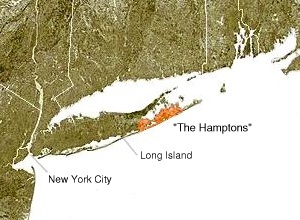 For other uses, see The Hamptons (disambiguation). The Hamptons, part of the East End of Long Island, comprise a group of villages and hamlets in the towns of Southampton and East Hampton, which together form the South Fork of Long Island, in Suffolk County, New York. The Hamptons form a popular seaside resort and one of the historical summer colonies of the northeastern United States. The Montauk Branch of the Long Island Rail Road, the Montauk Highway, and private bus services connect the Hamptons to the rest of Long Island and to New York City, while ferries provide connections to Shelter Island, New York and Connecticut. Stony Brook University's Southampton campus is located in the Hamptons. Sherrill Farmhouse in East Hampton, New York is listed on the National Register of Historic Places. The Shinnecock Reservation of the Shinnecock Indian Nation lies within the borders of the Town of Southampton, adjoining Shinnecock Hills and the Village of Southampton. These areas constitute the core vacation area of the east end of Long Island. The Hamptons are home to many communities. Historically, it has been devoted to agriculture and fishing. Many farms are still in operation in the area. There are three commercial vineyards operating in the Hamptons as well. Given the area's geographic location, it maintained stronger commercial and social links to New England and the nearby states of Connecticut and Rhode Island. Many of the original settlers were from and most of the trade links were with communities in Connecticut. Indeed, much of the older architecture and aesthetics of the villages in the Hamptons resemble New England. This is especially true for Sag Harbor Village and East Hampton Village. Once direct rail links to New York City were established, the community of summer vacation residents expanded significantly. The Village of Southampton, which is the oldest of the Hamptons and the most westward of the villages in the core area of the Hamptons, grew rapidly. It remains the largest and most diverse of the Hamptons' towns. The other villages and hamlets grew at a slower rate over time. The agriculture community became supplemented by artisans and professionals (mainly in Southampton Village and Sag Harbor Village), and then by a large influx of artists. As a result, the arts community in the Hamptons has origins extending back to the nineteenth century. The Art Village in Southampton and the community of Springs in East Hampton town hosted a number of resident artists and art schools (e.g., the Shinnecock Hills Summer School founded by William Merritt Chase). The villages and the hamlets are distinguished by their significant population increases during the summers, although the Hamptons have increasingly become a year-round destinations for New Yorkers seeking a refuge on weekends. Residential real estate prices in the Hamptons rank among the highest in the US, and, as of 2015, the real estate market was very strong with prices rising for both home buyers and sellers and rentals. Historically, real estate south of Route 27 ("south of the highway"), the main transportation artery in the Hamptons, was more highly valued. Land south of Route 27 is closer to the ocean, and the road served as a marker for social standing and land valuation. The most expensive neighborhoods lie south of the highway, and most of all in the so-called Estate Areas of Southampton Village, Water Mill, Bridgehampton, Sagaponack and East Hampton Village. Notable streets include Ox Pasture Road, Halsey Neck Lane, Coopers Neck Lane and First Neck Lane in Southampton Village and Lee Avenue and West End Road in East Hampton Village. Oceanfront property commands a high premium over other real estate. The oceanfront streets in Southampton Village (Gin Lane and Meadow Lane) and East Hampton Village (Lily Pond Lane and Further Lane) rank among the most expensive roads in the country. Sagaponack, Water Mill, and Bridgehampton were cited by Business Week magazine as being the first, sixth, and eighth most expensive ZIP codes in the nation, respectively. In 2015, according to Business Insider, the 11962 ZIP code encompassing Sagaponack, within Southampton, was listed as the most expensive in the U.S., by real estate-listings site Property Shark, with a median home sale price of $5,125,000. In 2016, according to Business Insider, the 11962 ZIP code encompassing Sagaponack, within Southampton, was listed as the most expensive in the U.S., with a median home sale price of $8.5 million. Amenities in the area include the Southampton Arts Center, the Southampton Cultural Center, the Pollock-Krasner House and Study Center in East Hampton; the Parrish Art Museum and the Watermill Center in Water Mill; the Guild Hall, a museum and theater, in East Hampton . In the sporting world, the region's golf courses are very highly regarded. The private golf clubs in Southampton are among the most exclusive and expensive in the nation. Those courses include the National Golf Links of America, the Shinnecock Hills Golf Club and the Sebonack Golf Club. These golf clubs are currently ranked 8th, 4th and 41st within the United States by Golf Digest. There is also the Maidstone Club in East Hampton (ranked #72 by Golf Digest). Other private clubs include The Bathing Corporation of Southampton, the Southampton Bath and Tennis Club, and the Meadow Club in Southampton Village and the Maidstone Club in East Hampton. As of 2015, commercial and point residential development has been ongoing, and the Hamptons continued to be a vacation spot for the wealthy. The Hamptons have also become a notable place for prominent members of the LGBT community. The Hamptons are connected to New York City and the rest of Long Island by a series of roadways (most notable of which are Route 27A, also known as Montauk Highway, and Route 27, also known as Sunrise Highway), rail service, and bus service. There are also several small airports throughout the Hamptons which offer both private and commercial service on small aircraft and helicopters. The Long Island Rail Road provides limited rail service seven days per week via the Montauk Branch connecting towns and hamlets in the Hamptons to Montauk and New York City. Hampton Jitney and Hampton Luxury Liner coach bus services provide slightly more frequent passenger travel between New York City and the Hamptons, especially during summer months. Local Suffolk County buses also provide service to neighboring areas. The majority of the 1989 film Weekend at Bernie's takes place in The Hamptons but it was filmed on Bald Head Island in North Carolina. In the 2003 film Something's Gotta Give, the main character resides in a beach house on Meadow Lane in Southampton Village. In the 2004 film Eternal Sunshine of the Spotless Mind, the two main characters meet on a train to Montauk. The majority of the 2004 film White Chicks takes place in The Hamptons. In Inside Job, a 2010 documentary film about the financial crisis of 2007–2010 directed by Charles H. Ferguson, the Hamptons is depicted as a hub for Wall Street traders and investment bankers. The film covers a bird's eye view of the beaches and homes in the area. The 2011 film Something Borrowed takes place in the Hamptons. In Friends, the finale of season 3 ("The One at the Beach") takes place at a beach house in Montauk when Phoebe goes there in search of her birth mother. The Pruitts of Southampton was a television series that ran from 1966-67 starring Phyllis Diller. The sitcom was based on a wealthy family that had lost all its money and had to rent rooms to eccentric boarders to make a living. In Seinfeld, an episode from Season 5 featured Jerry Seinfeld, Elaine Benes, George Costanza, and Cosmo Kramer visiting the Hamptons where various antics occur (including the appearance of an ugly baby, Kramer illegally obtaining lobsters from cages, and George getting caught naked and being a victim of "shrinkage"). In a season 9 episode "The Wizard", George has an "imaginary place in the Hamptons" that he takes the parents of his deceased fiancee Susan Ross to in an impromptu game of "chicken". The popular food network program Barefoot Contessa is set primarily in the Hamptons and features local ingredients and recipes, usually centered on host Ina Garten's social calendar. In the show Louie, comedian Louie CK performs a stand up comedy set at a private charity function in the Hamptons with comedian Jerry Seinfeld. Reality stars Khloé Kardashian, Kourtney Kardashian and Scott Disick are the main cast of the show Kourtney and Khloé take The Hamptons, that begun airing in November 2014. The show is based on the family spending the summer at a house in The Hamptons, and features guest appearances from other members of the famous family. The series Royal Pains takes place in the Hamptons, although most of the series is filmed in surrounding towns and portions of Long Island. The series Revenge takes place in the Hamptons, though it is primarily filmed in North Carolina and Los Angeles. In addition to this, Gossip Girl was set in The Hamptons during the first two episodes of season 2, while the cast were away from New York City for summer vacation. The series Castle has taken place in the Hamptons on three occasions, the first in the show's fifth season. The second was at the end of the show's sixth season. The third and most recent trip to the Hamptons for the show was in the show's seventh season. Much of the final season of the series How I Met Your Mother takes place in a fictional hamlet in the Hamptons called "Farhampton". In the Jessie episode "Caught Purple-Handed," the Ross family is confirmed to have a house in the Hamptons. It was also mentioned by Bertram that Jessie Prescott has been banned from the Hamptons ever since she "fell asleep" on Channing Tatum's front lawn....twice. On the Showtime cable network show Billions, the lead character, a hedge fund billionaire, purchases a large oceanfront home on Meadow Lane, in Southampton and brings more negative attention to the lavish lifestyle he lives. On the Showtime cable network series The Affair, the lead characters Alison Lockhart (née Bailey) and Noah Solloway meet in Montauk, where much of the series takes place. Alison is a Montauk native. In basketball, the current iteration of the Golden State Warriors' so-called "Death Lineup", consisting of Stephen Curry, Kevin Durant, Draymond Green, Andre Iguodala, and Klay Thompson, is more often called the "Hamptons Five". The term was coined by San Francisco Bay Area journalist Tim Kawakami in the 2016 NBA offseason after the Warriors signed Durant out of free agency. This played off the fact that the other four named players, all part of the original "Death Lineup", traveled with team officials to The Hamptons to meet with and recruit Durant. ^ Vanessa Wong (2010). "The 50 Most Expensive Small Towns in America 2010". Business Week. Retrieved March 25, 2013. ^ "The Most Expensive Streets in the Hamptons - PropertyShark". November 15, 2012. ^ "Gin Lane: 10 fascinating facts". ^ "'Billionaire Lane:' One of the nation's most expensive addresses". ^ "The Hamptons' Billionaire Lane, Mapped". ^  Accessed July 5, 2015. ^ John Ortved (August 4, 2015). "Summer Peacocking in the Hamptons". The New York Times. Retrieved August 8, 2015. ...a standout event on the Hamptons social calendar. ^ "The Itinerant Golfer's Take on Maidstone Club (West)". golftripper.com. Retrieved 4 June 2015. Maidstone Club is was founded in 1891 and was the summer retreat of New York City’s most wealthy and socially connected families. ^ Steven Gaines (June 1, 1998). Philistines at the Hedgerow: Passion and Property in the Hamptons. Little Brown & Co. p. 17. ISBN 9780316309417. …they all belonged to the same clubs…. ^ "SOUTHAMPTON'S BEAUTIES. ; A Charming Region at Its Best in the Summer Months". The New York Times. May 27, 1893. Retrieved August 9, 2015. The beautiful villages clustering around old Southampton, including Quohue, Good Ground, the rest of the Hamptons, and the incomparable Shinnecock Hills combine to make as close an approach to Eden as can be found in a long journey. Exclusive—in the best sense of the word—society is here represented during the summer by its choicest spirits. Well-bred men and women find a congenial atmosphere, refined attractions in plenty, and innumerable charms about these quaint old villages. ^ Jim Rutenberg (August 28, 2015). "The Battle for the Soul of the Hamptons". The New York Times. Retrieved August 30, 2015. ...a new horde of speculators (moguls, nightclub impresarios and their yearly multiplying conspicuous consumers) drives and flies ever eastward from Manhattan toward that beguiling jewel of Long Island, the Hamptons. ^ Ariel Levy. "Hamptons Heat Wave: Ladies Mile". NEW YORK Magazine. Retrieved September 17, 2017. ^ "Index of /indexhold". tonightatthemovies.com. ^ Chang, Bee-Shyuan (August 3, 2011). "The Real Housewives of New York City: Real Housewives of New York City Hit the Hamptons for 'Business'". People. Retrieved September 17, 2011. ^ Schwarz, Alison (August 6, 2011). "Fashion and Style: 'Housewives' at Every Turn in the Hamptons". The New York Times. Retrieved September 17, 2011. ^ Kellogg, Valerie (February 23, 2010). "Real LI (Buying and selling real estate in the communities of Long Island): Kelly Killoren Bensimon offers East Hampton home for rent". Newsday. Retrieved September 17, 2011. ^ "Seinfeld Guests on Hamptons-Filmed 'Louie' Episode - Dan's Papers". May 7, 2014. ^ "Kourtney & Khloé Take the Hamptons - E! News UK". E! Online. ^ Curtis, Charles (May 15, 2018). "Why is the Warriors' lineup known as 'The Hamptons Five'?". For the Win. USA Today. Retrieved October 3, 2018. "Real Estate 101 in the Hamptons", The New York Times. "Studios by the Sea", Vanity Fair, August 2000. "The Most Expensive Golf Courses in the Country", Forbes magazine.